EquilinBASIC is a unique 7 in 1 formula. The main ingredients of EquilinBASIC are: magnesium, vitamin E - without selenium, MSM, vegetable Omega 3 fatty acids (DHA and EPA), essential amino acids, probiotics and mycotoxin binding agents. Feeding EquilinBASIC replenishes these deficient ingredients in safe dosages. EquilinBASIC corrects the acidity of the intestines. The composition of EquilinBASIC is based on scientific research. The 7 in 1 formula of EquilinBASIC saves time and costs. 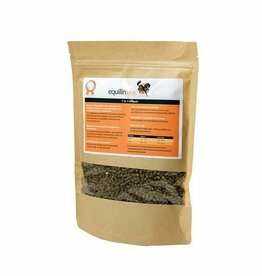 Instead of spending an average of £3.50 per day on a variety of (powder)supplements containing the separate ingredients, when using EquilinBASIC you are actually spending less than a third of that number and your horse will have 1 easy and palatable little pellet to digest. EquilinBASIC is intended for continuous feeding of the horse and is used in addition to suitable forage - hay or haylage. EquilinBASIC can be supplemented by the regular brands of cubes and/or mixes, and by EquilinBALANCER. Due to the unique 7 in 1 composition of EquilinBASIC, the effect of the combined ingredients is reinforced. In addition, less concentrates can be fed after a month as horses will become more energetic due to the fact that there is an improved absorption of the volatile fatty acids in the gut, originating from forage.